2/4/2014 - Jackson Hole News & Guide - Do wolves, cougars help curb diseases? 9/1/2014 - Helena Independent - Should Montana take control of federal lands in the state? 3/1/2014 - Flathead Beacon - Plains Bison: Forever Wild or Forever Lost? 16/12/2013 - Oneida Dispatch - Have the government's ‘critter assassins' gone rogue? 29/9/2013 - Bull Moose Gazette - WILD BISON ON THE MONTANA PRAIRIE? MAYBE. BUT WHAT IS WILD? 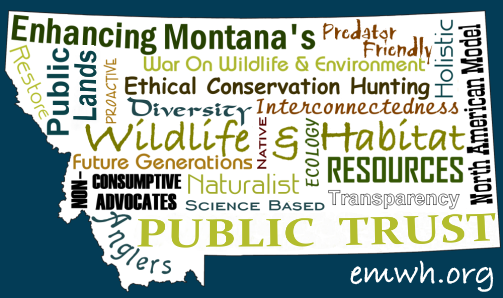 24/9/2013 - Missoulian - Bait hunts cause host of problems for wildlife, habitat and ethical hunters Can you help? 23/9/2013 - Wildlife News - Are Domestic Sheep responsible for the Bighorn Sheep Die-off in the Mojave?